Four stores in Intu-owned shopping centres are facing closure. A house-proud mum says she had "no choice" but to brazenly make off with a £1,500 sofa from House of Fraser in front of shocked staff. 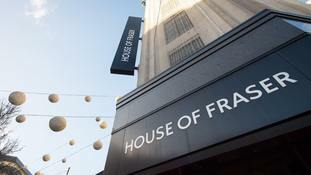 House of Fraser collapsed into administration a week and a half ago. The department store has warned of delayed deliveries since it was bought by Sports Direct last week. C.banner, which owns Hamleys, was going to plough £70 million into the retail chain.